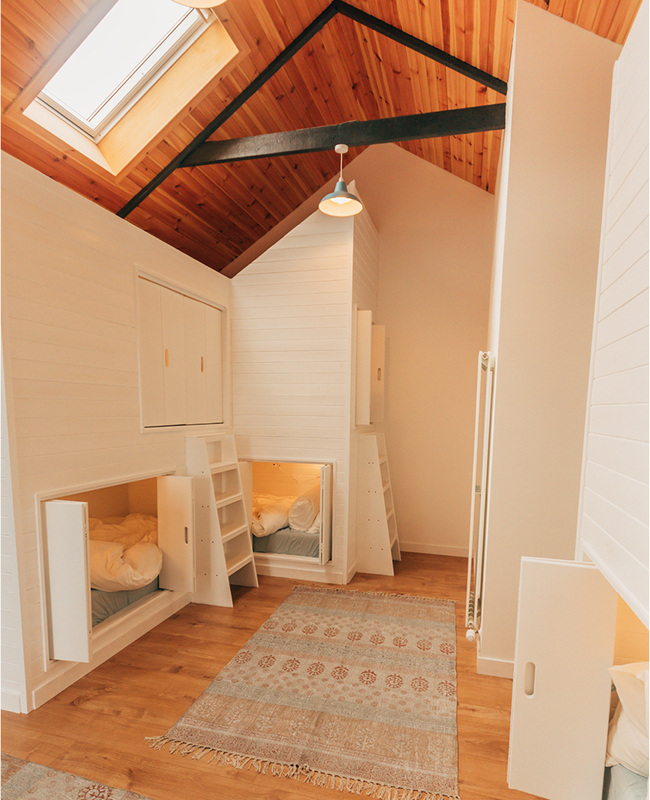 The Highland Haven has two rooms, The Burrow which sleeps 4 and The Barn which sleeps 6. 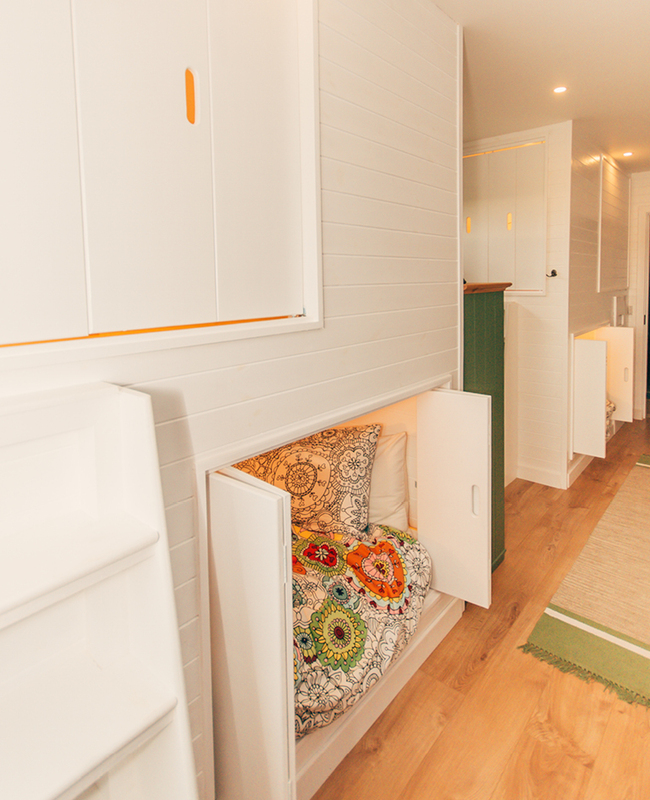 Our box beds have been specially designed with USB socket, reading light and privacy shutter.Each room has their own luxurious en-suite shower room. 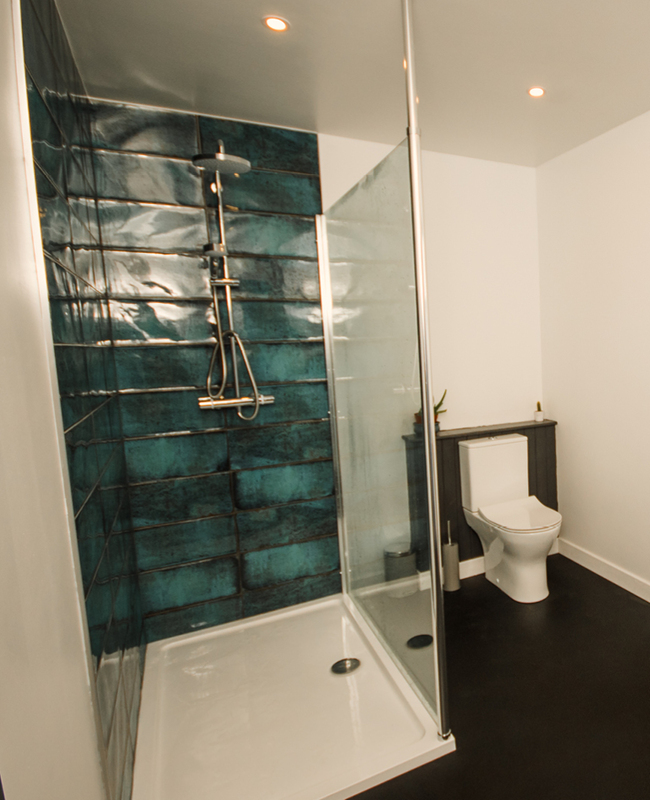 There is also a third shower room with disabled access and facilities. We provide all bedlinen, and towels are available for a small charge. The Highland Haven has a large open plan living/dining/kitchen area with stunning views out to Dunnet Head. The well equipped kitchen has a large cooker, two fridges (one for each room), and ample storage, easily allowing for a self-catered stay. There is a large dining table, perfect for lazy breakfasts to mull over the day’s plans and relaxed dinners to share stories of your adventures. There is a cosy lounge area with a mesmerising wood burning stove, comfy sofas, books and games for your enjoyment. Laundry facilities are available, and drying areas for outdoor gear and wetsuits. We have a secure bike shed and ample parking. Breakfast essentials are included ie tea, coffee, bread, milk and cereal. We also offer in house catering for larger groups (please contact in advance). Although we encourage you to switch off and enjoy a more mindful stay, wifi is readily available. We couldn’t have wished for anywhere better. This was our (3 members of one family with 2 friends , a girlfriend and a toddler) first stop on the NC500 and nowhere else could match it. The welcome was warm (the owners lighting us a log fire on arrival) , the accommodation fantastic, clean and really quirky – we loved the beds and the privacy of the bunks meant those of us on our phones and reading didn’t disturb those wanting to sleep. Facilities were great, breakfast a treat and the views fantastic (particularly watching passing ships whilst lovely and warm). Absolutely beautiful bunkhouse – probably the best hostel/bunkhouse accomodation Ive ever stayed in. Lovely modern decor, clean rooms, well equipped, warm shower. Nice Scandinavian theme. Cosy with wood fire. Wonderful customer service + warm welcome from our host. Fantastic location overlooking the meeting point of the Atlantic and Pentland Firth with Orkney as the backdrop. The building is modern, light and airy. Very well fitted out. Bronagh and her husband could not have been more welcoming and helpful.